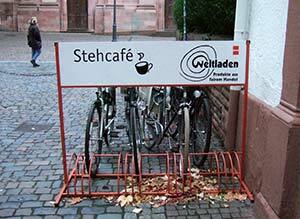 ABOVE: A bicycle rack in the Altstadt, with the Jesuitkirche behind. Heidelberg is a pedestrian-friendly city--especially in the Altstadt, or Old Town, where your explorations are likely to begin. The Altstadt is a long, narrow strip of medieval cityscape on the south bank of the Neckar River. Most sights are within a block or two of the Hauptstrasse or Main Street, which runs--with an occasional name change--from the department stores of the Bismarkplatz to the Karlstor at the eastern end of town. Major sights in the Altstadt are well-documented in a German-language guidebook, Marco Polo: Heidelberg, which also covers such topics as hotels, dining, shopping, and nightspots. Even better, if you don't read German, is the English-language Castle and City Guide Heidelberg am Neckar (which isn't as comprehensive or up to date as the Marco Polo guide and may be hard to find). For other guidebook titles, see your bookseller or Amazon.com. Our advice: Get hold of a map (such as the 1:15000 ADAC CityPlan, shown at left), or use the map in your guidebook to explore the Altstadt as the spirit moves you. Visit the Alte Universität with its historic assembly hall; a combined ticket will also get you into the Studentenkarzer (see Student Prison article), where academic miscreants did time for drunkenness, womanizing, pig-stealing, and other sins from the 1500s until 1914. Wander into the churches, especially the Gothic Heiliggeistkirche on the Marktplatz (with its built-in market stalls) the Jesuitkirche, and the Peterskirche (Heidelberg's second-oldest church, dating back to 1316). Walk down the Steingasse toward the river, where you'll encounter the Brückentor (Bridge Gate) and the Alte Brücke or old stone pedestrian bridge across the Neckar, which inspired Goethe to gush about its beauty when he first saw it in 1797. Walk out onto the bridge and enjoy the views of Heidelberg's river, old town, and castle. Schloss Heidelberg (see Heidelberg Castle article) deserves a full morning or afternoon: It's on a hill behind the Altstadt, which you can reach on foot (via winding streets or paths) or with the Heidelberger Bergbahn (see Heidelberg Funicular article), which runs to the castle and on up to the Königstuhl with its long-distance views, falconry center, children's fairy-tale park, and other attractions. The Schloss is a pleasant combination of ruins, restored rooms (complete with guided tour), a massive wine vat, viewing terraces, an excellent pharmacy museum (see next page), and even a wedding chapel that attracts vast numbers of Japanese couples. You can walk along the outside of the castle free of charge; to go inside, buy a ticket at the office near the funicular station, and book a sightseeing tour once you're inside the grounds. Heidelberg's tourist office has inexpensive guided walking tours year-round, with English narration available several days of the week from spring through fall. German-language evening tours and bilingual bus tours are also available. If you understand German, you might enjoy an historic walking tour with Stadtfuehrungen Heidelberg, which offers such themed tours as "Henker, Hexen, Huebschlerinnen" (led by the "executioner's daughter") and "Werwölfe, Wiedergänger und Vampyre." If you've got time (and if you're visiting in season), a Weisse Flotte boat trip on the Neckar offers a relaxing break from city sightseeing. Other nearby excursions include the suburb of Handschuhheim (north and inland from the Alte Brücke), which has an 11th Century church with several double tombs, and the Heiligenberg, where you can enjoy the views, peek into the ancient "Pagan's Hole" well, and visit the ruined abbey church of St. Michael. Finally, no tour of the region would be complete without an excursion to the music-festival town of Schwetzingen, with its palace and gardens that have been described as "Germany's Versailles." For information on the castle, including driving directions, see the Schloss Schwetzingen Web site. Neckar boat photo copyright © Heidelberg Kongress und Tourimus GmbH.